In April this year, Iceland’s Ministers of the Environment and of Industry presented a parliamentary resolution for Iceland’s Energy Master Plan, in which the controversial plans to dam river Þjórsá are put on hold while the unique geothermal areas of the Reykjanes Peninsula are set for a monstrous exploitation — one that will turn the peninsula into a continuous industrial zone. For the last weeks, the resolution has been in the hands of the Industries Committee of Iceland’s parliament — a process that included more than 300 letters of remarks, sent in by individuals, associations, institutions and corporations. The remarks can generally be split into two groups based on senders and views: firstly, individuals and environmentalist associations who above all protest the afore-mentioned plans for the Reykjanes peninsula; secondly, companies and institutions with vested interests in the further heavy industrialization of Iceland who demand that the Master Plan’s second phase goes unaltered through parliament — that is, as it was before the parliamentary resolution was presented, in which the planned Þjórsá dams and other hydro power plants are included in the exploitation category. One of the remarks sent in differs from the others as it evaluates energy production and nature conservation in a larger, long-term context. That remark, written by Helga Katrín Tryggvadóttir, MA in development studies, is published here below, translated from Icelandic by Saving Iceland. I find myself inclined to make a few remarks regarding the Industries Committee’s discussion about the Energy Master Plan. My remarks do not concern particular natural areas but rather the comprehensive ideas regarding the scope and nature of the protection and exploitation of natural areas. Since the making of the Energy Master Plan begun, much has changed for the better as researches and knowledge on energy production and nature conservation continuously advance. The social pattern as well as opinions on nature conservation have also changed rapidly since the first draft for an Energy Master Plan was published, and the emphasis on nature conservation constantly increases. With this in mind it is necessary to take into account that during the next years, this emphasis on nature conservation is likely to increase even further. Therefore it is important for the Industries Committee to remember that keeping natural areas in pending does not prevent future utilization, whereas areas exploited today cannot be protected tomorrow. The many negative impacts of geothermal and hydro power plants have not been discussed thoroughly enough in Iceland. This can probably be explained by the the fact that these are renewable energy sources and thereby, people tend to view them as positive options for energy production. Thus we often hear that it is better to operate energy intensive industries here, using renewable energy sources, rather than in countries where the same industries are powered by electricity produced by coals and oil. However, when these issues are looked at it more accurately, we have to be aware of the fact that despite hydro and geothermal power’s renewability, their current utilization in Iceland is by no means sustainable. Using the hydraulic head of glacial rivers, hydro power plants require reservoirs which deplete vegetated land, the reservoirs get filled with mud and by time the area becomes an eroded land. When it comes to geothermal areas, exploited for energy production, the seizure of fluid is much greater than the inflow into the geothermal reservoir and therefore the geothermal power dries up by time. At that point the area has to rest for a time still unknown in the geothermal sciences. Thus it is clear that although we are dealing with renewable energy sources, they do not at all allow for infinite energy production, and additionally the power plants themselves entail environmental destruction. It is clear that the utilization of these resources has to be executed very carefully, and preferably, all further utilization plans should be put on hold until it is possible to learn from the experience of the plants built in the very recent past. A lot of emphasis has been put on the idea that Iceland possesses huge amounts of “green energy,” meaning that this energy does not burn fossil fuels. Thereby it is assumed that no CO2 emission takes place. This is, however, far from the truth: in 2008 the CO2 emission from geothermal plants in Iceland amounted to 185 thousand tons, which is 6% of the country’s total CO2 emission1. Hydro dams also add to the amount of carbon in the atmosphere: big reservoirs cause the drowning of vegetated land, wherein rotting vegetation emits methane gas, increasing global warming. It is estimated that about 7% of carbon emitted by humans come from such constructions2. The sediment of glacial rivers affects the ocean’s ecosystems and nourishes algae vegetation by the seashore. Marine organisms play an important part in extracting carbon from the atmosphere; it is estimated that such vegetation extracts about 15 times more of CO2 than a woodland of the same size3. Annually, the ocean is believed to extract 11 billion tons of CO2 emitted by men4. By damming glacial rivers, entailing disturbance of their sediment and of algae vegetation, Icelanders are not only threatening the fish stocks around the country, and thus the country’s fishing industry, but also further contributing to global warming in a way which is more dangerous than deforestation, though the latter has undergone much harsher criticism worldwide than the destruction of oceanic ecosystems. In the Energy Master Plan’s second phase, possible geothermal power plants are listed in 20 out of the 25 highest seats of exploitation. If the planned hydro dams, Hvamms- and Holtavirkjun, in river Þjórsá will be kept in pending — which I rejoice as a resident of the Skeiða- og Gnúpverjahreppur region — geothermal power plants will occupy 22 out of the 25 seats. Due to the fact that so little is known about the long-term impacts of geothermal power plants, this ordering is a matter of concern. 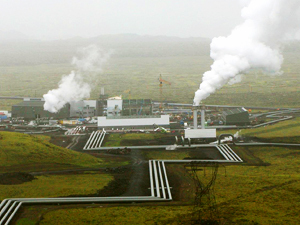 Before further construction takes place, it is necessary to wait until more experience is gained from the already operating geothermal power plants. Many of the problems connected to these plants are still unsolved, for instance the dangerous material in the plants’ run-of water as well as their polluting emissions. This has to be taken into consideration, especially near the capital area of Reykjavík where sulphur pollution is already very high5. It also has to be taken into account that geothermal energy production is not sustainable, as an geothermal area’s heat supply eventually dries up. Their usage allows for 50 years of production, which of course is a very limited amount of time. If the plan is to use such energy for industrial development it has to be kept in mind that 50 years pass very quickly, meaning that the jobs at stake are no long-term jobs. At the same time, such a short-term utilization encroaches on future generations’ right to utilize the geothermal energy sources, not to mention their right to utilize these areas by protecting them for outdoor activities and creation of knowledge, as Iceland’s geothermal areas are unique on a global scale. For the last weeks, we have witnessed how the already exploited geothermal areas, or those where test-drilling has taken place, have not at all been utilized in a way that goes together with tourism and outdoor activities, as the areas’ appearance and environment have been damaged on a large scale6. When it comes to economical arguments, people often tend to call for short-term employment solutions, stating that it is important to construct as many possible power plants in the shortest time in order to create as many jobs as possible. The fact, however, is that a construction-driven economy will always lead to instability, and such instability is indeed the Icelandic economy’s largest bale. Above all, Iceland’s economy needs stability and a future vision that sees further than 10 years into the future. For a stable future economy to be built, it has to happen in a sustainable way, whereas continuous aggressive exploitation of the country’s natural resources will simply lead to an era of regular economic collapses. By putting such strong emphasis on the aggressive exploitation of hydro and geothermal resources, with the appendant construction bubbles, a situation of unemployment will be sustained, broken up by occasional and differently short-lived boom periods in between. 1. Birna Sigrún Hallsdóttir, Kristín Harðardóttir, Jón Guðmundsson og Arnór Snorrason. 2009. National Inventory Report Iceland 2009 Submitted under the United Nations Framework Convention no Climate Change. Umhverfisstofnun. 3. Worldwatch Institute. 2011. Oceans Absorb Less Carbon Dioxide as Marine Systems Change. 4. The Guardian. 2009. Sea Absorbing Less CO2, Scientists Discover. 12. janúar 2009. 5. Náttúruverndarsamtök Íslands ofl. 2011. Umsögn um drög að tillögu til þingsályktunar um áætlun um vernd og orkunýtingu landsvæða. 6. Ómar Ragnarsson. 2012. Já, það varð svona og það verður svona. Morgunblaðið. 2012. Borteigar . „Verður þetta allt svona ?“ 5. maí 2012.
International Rivers. Problem With Big Dams. International Union for Conservation of Nature. 2009. Ocean Carbon Central for Climate Change.